It’s official – PBS will take its first ever trip to San Diego Comic-Con International in a couple of weeks. Popular series Sherlock will host its first panel at the gigantic fan convention, and fans everywhere are already hoping that we’ll finally get some real information about the its highly anticipated third season. The panel will include co-creators Steven Moffat and Mark Gatiss, along with producer Sue Vertue, and will be hosted by Entertainment Weekly writer James Hibberd. Sadly, neither Benedict Cumberbatch nor Martin Freeman will be in attendance, what with both of them working on other projects during the ten week break from filming on Sherlock Series 3. While we’ll all obviously miss seeing Cumberbatch and Freeman (you can already hear the fangirl wails from San Diego), it should be still be very exciting to (finally) hear a bit about Series 3 straight from the proverbial horses’ mouths. And, if we’re very lucky, maybe we’ll get a peek at some new footage? Two of the three new episodes are finished filming after all. 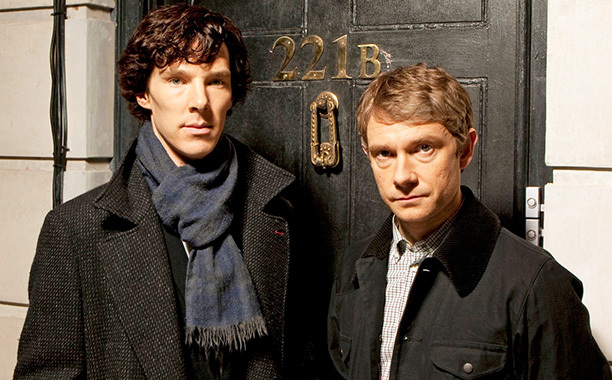 In slightly less exciting news for die-hard Sherlock enthusiasts, EW also confirmed that Series 3 of Sherlock will premiere in the US in 2014, at some point after the UK transmission. While this news is probably not a surprise to most viewers, it’s nevertheless still a bit depressing. Take heart, however – there is no UK airdate set as yet, and it would seem likely that the series won’t premiere across the pond till toward the end of 2013, or possibly even at the New Year. Cumberbatch himself – as well as the rest of the Sherlock production staff – is quite keen to shorten the gap between UK and US transmission, so perhaps our wait will not be too torturous – or at least will be shorter than last time. We’ll keep you posted as we hear more. Are you excited at the prospect of Sherlock making appearance at Comic Con? If you could ask Moffat and Gatiss during their panel, what would it be?